Tari Tari and the glory of love and art. From the moment Konatsu Miyamoto pops on her green headphones and sings to a bewildered audience of public park-goers, I was sold on Tari Tari. There’s a freeness in Konatsu’s first song that is irresistible, especially as the series establishes that she had already experienced stage fright in a formal setting. 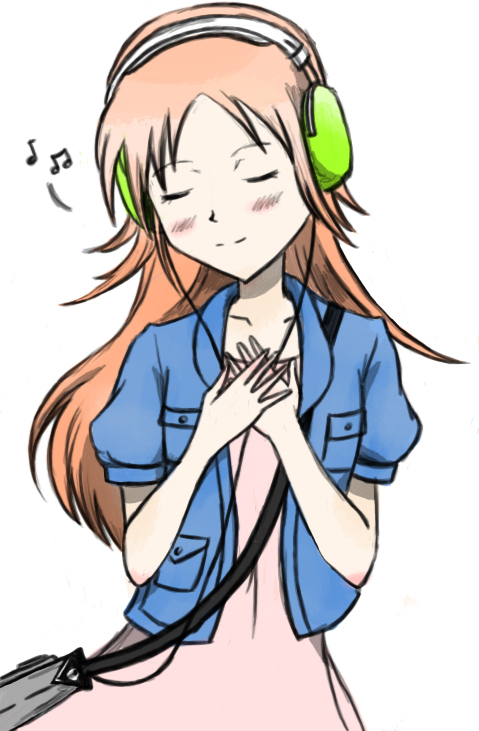 Watching Konatsu perform for herself, enjoying the moment simply because she loves to sing, struck me. Like Konatsu’s friends in the series, I couldn’t look away. It is my firm belief that one is at their most when they are immersed in doing what they love, be it music, sports, visual arts, writing, cooking, public speaking, etc. Tari Tari not only embraces this but also challenges several conceptions around art as a career choice as well as an innate passion. In episode seven, Konatsu and crew are still attempting to acquire a practice space when they run straight into a brick wall of ire from the current choir club. Previously, the series had established club advisor Takakura’s distaste for Konatsu’s upstart group, with the cause of said hostility buried within her own personal relationship with Wakana Sakai’s mother; however, the series pointedly highlights the “official” choir club’s derision of Konatsu separately and with great effect. The most important aspect of this conflict is that the choir club is hardly being petty or spiteful, they simply see Konatsu’s efforts as play. For the official club, singing is a competition with an importance rivaling at the very least an after-school job, and at most a career choice. They are dedicated, they are serious, and they don’t have time for Konatsu’s childish antics. Thus, the series establishes two camps: the official choir club and Konatsu’s comparatively rag-tag merry bunch. The former is performing in a more professional manner, possibly with career aspirations in mind, while the latter is performing for the love of what they are doing (specifically Konatsu who simply loves to sing, and Wakana, who discovers that composing is an intrinsic piece of her personality as well as a bridge to accepting the death of her mother). All too often, when one has a passion for an art, they are told to find something else to do instead that is more lucrative, and serious within a social context, in order to support themselves financially. Art is not a serious career, it’s something one does on the side while working another job, unless one is far beyond naturally prodigious, and even then it’s an immense struggle to be well-regarded. In a so-named “perfect world” artists would be able to do what they love and be compensated for it as well as any other career choice. It would still require hard work, with no small amount of passion and ambition, but at the end of the day, an artist would be able to support themselves financially through their art, rather than putting it to the side as a hobby. The question of monetary compensation for an art (again, be it performance, literary, musical, visual, etc.) is always a tricky one. Because art is not considered as productive as other careers from a general social standpoint, and because artists are expected to be doing it for their love of that art, there is frequently an undercurrent of expectation from an audience that art is free and one does not have to financially compensate the artist. After all, if they are doing it out of passion, the glory of working at what one loves, then that in and of itself is its own reward. Tari Tari touches on this, although refrains from commenting on it one way or another, and it resonated with me profoundly. I am a visual artist. If you place a pen, pencil, paintbrush, or similar utensil in my hand, I will create compulsively. The conference call notes of my day job are covered in drawings. I left raucous parties in university to return to my room, alone, and paint. If I ever win the lottery, I will purchase a house by the ocean, acquire a large, friendly dog, and paint every day, all day. However, supporting myself financially through painting is not feasible, therefore, I will soon be attending graduate school to become an elementary school teacher. I don’t regret this decision at all, in fact I’m looking forward to it immensely, but the fact that it is not truly the thing I love doing remains. When I do create something, although it is incredibly emotionally satisfying, society requires me to to have an income in order to survive so yes, I would appreciate financial compensation. As mentioned previously, the series holds back from making any commentary on the matter. Konatsu’s club ends up overcoming their odds to perform Wakana’s song, Sawa chooses the difficult path of following her passion, in spite of the odds stacked against her, proving that she’s “serious.” The official choir club members end up helping alongside Konatsu and company to pull of their performance. And the choir club advisor’s heart grew three sizes that day. It would seem that the primary feeling Tari Tari wishes to conclude with is a gentle push to the viewer in the direction of their own dreams (be they categorized as tertiary hobbies or career choices). How much of one’s career is supposed to be fun? How much am I allowed to be compensated for doing what I love, or is it a financially hopeless endeavor? Do I deserve to be happy by doing what I love as a career? Tari Tari may not have any answers for me; however, for contributing to the conversation, I am indebted to it. ← Miyuki, you are my angel.